Hello Quinoa, you’ve become a friend of mine. Well, not so much a friend, but a nice tasty way to start the day. In case you haven’t heard of it, Quinoa is a seed that kind of acts like a grain but is a super food! Apparently it’s full of full of protein, iron, fiber and bunch of other good stuff. You can read about it here. While it may be good for you, I just care about the taste! I have decided that there are too many things in this world I like to eat, so I am not going to start eating things I don’t like. 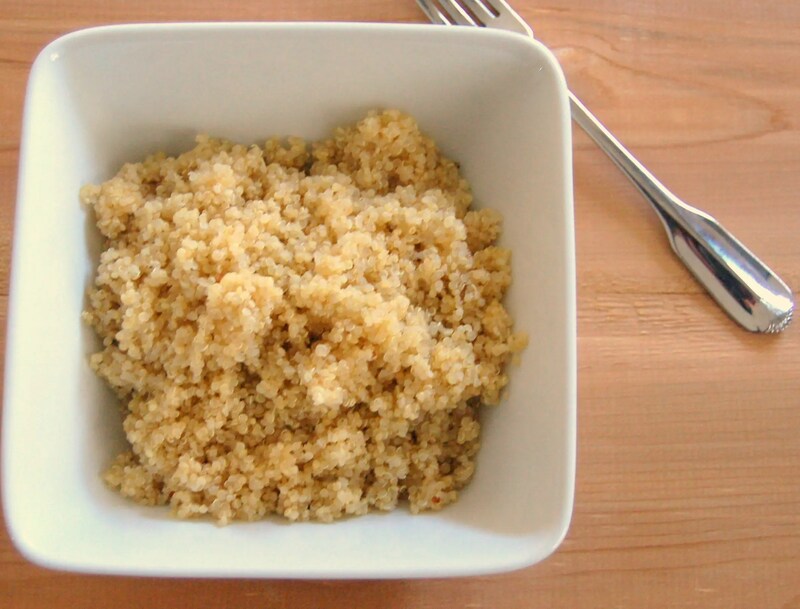 Quinoa has a nutty texture and is light. It cooks easily and is very versatile. 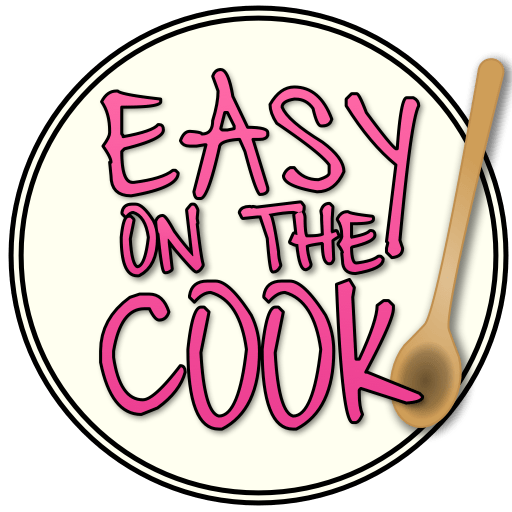 It’s great in salads, side dishes, as a cereal for breakfast and is great in these easy breakfast bites! Look at all those veggies. I think I feel healthier just looking at them. Start by putting olive oil in a pan over medium heat then add sausage with the casings removed. Cook and break up into small pieces. 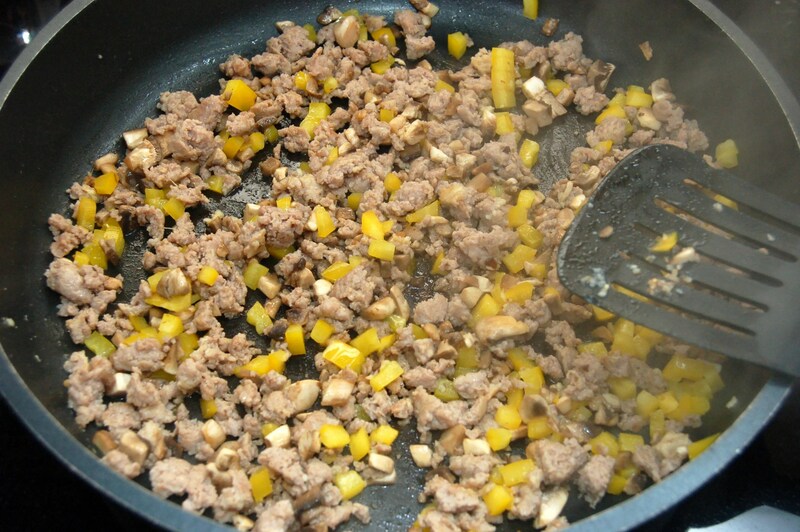 Add the mushrooms and yellow pepper and cook until veggies are soft. Taste the mixture before adding garlic and salt and pepper. Sausage can very on the amount of seasonings. Next add spinach and cook until it’s wilted. Stir in the cooked quinoa, and mix thoroughly. Add egg mixture to saute pan and let the eggs cook for 1-2 minutes without stirring until eggs just barely start to set on the bottom. 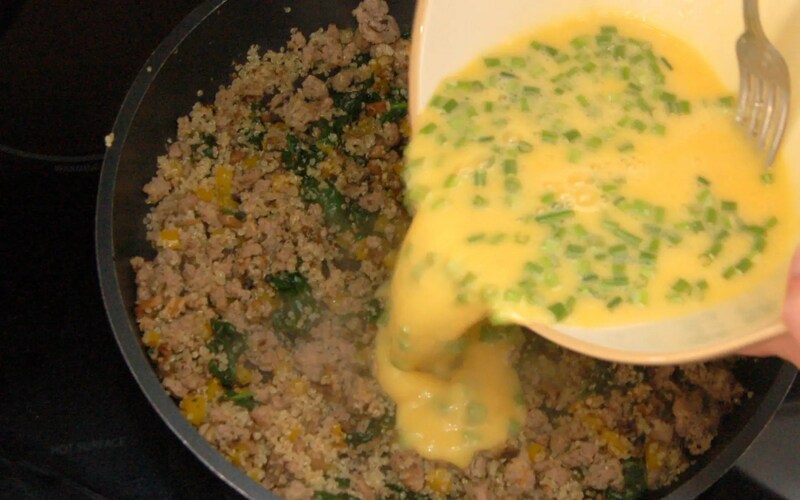 Remove from heat and gently stir eggs to make sure all ingredients are evenly distributed. 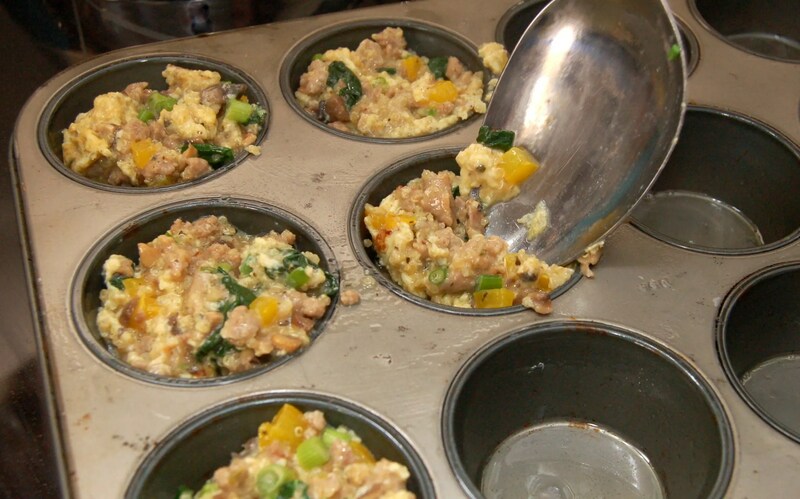 Spoon partially cooked egg and sausage mixture into well oiled or sprayed muffin tin. Top with quartered tomatoes. I like to put the tomatoes on the top because it gives the tomatoes a nice roasted flavor and it doesn’t make the muffin mushy like it would if they were inside the egg mixture. Look, I filled the muffin cups too much and only had enough for 11 muffins! Cook for 15 minutes or until middle is set. They taste great hot and if you have leftovers they are great warmed up in the microwave for a fast nutritious breakfast. Breakfast can be easy and healthy with this delicious egg dish. In a large mixing bowl crack eggs and add green onions. Set aside. 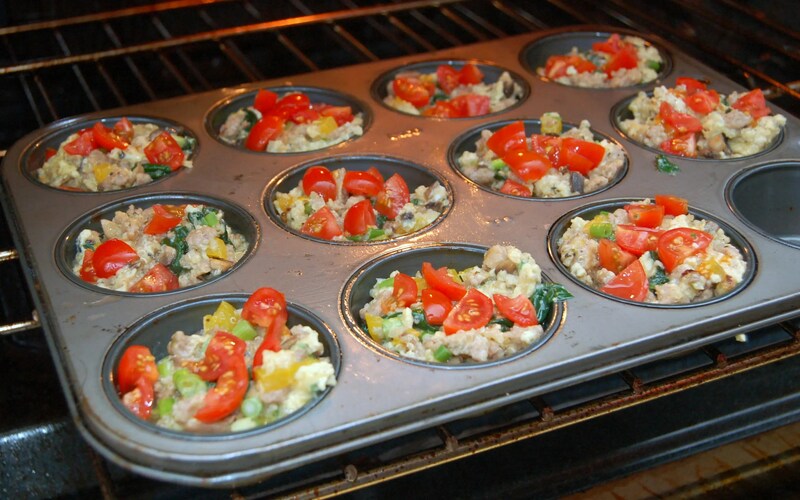 Spray or brush a muffin tin with oil. 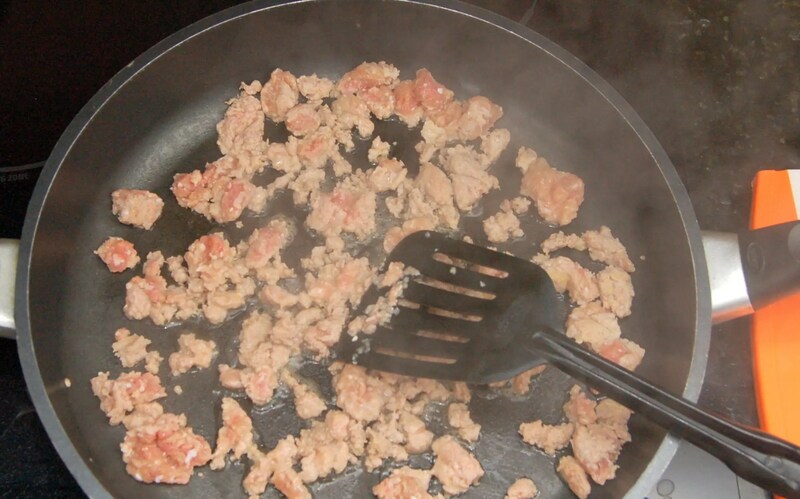 In a large saute pan on medium heat, add olive oil and turkey sausage with the casings removed. Break up the turkey sausage into small pieces and cook through. 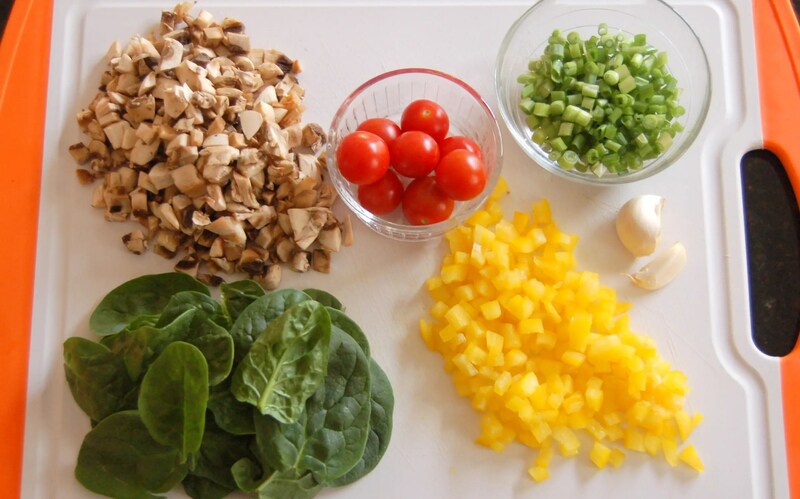 Add mushrooms and yellow bell pepper. Cook until veggies are soft, about 2-4 minutes. Now is a good time to taste the mixture, it will depend on the spice mix of the sausage (which can vary) on how much garlic and salt and pepper you need to add. 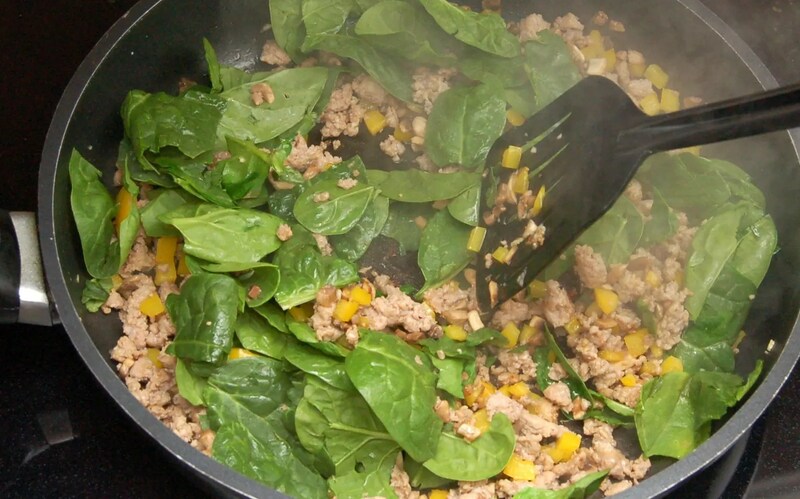 Add spinach and cook until just wilted, about 1-2 minutes. 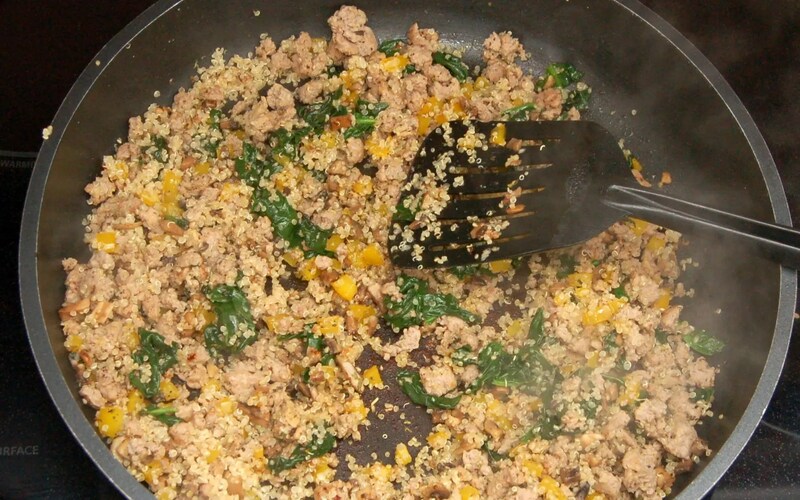 Mix in the cooked quinoa. Add egg mixture to saute pan and let the eggs cook for 1-2 minutes without stirring until eggs just barely start to set on the bottom. Remove from heat and gently stir eggs to make sure all ingredients are evenly distributed. Spoon partially cooked egg and sausage mixture in to muffin tin. Top with quartered tomatoes and add just a dash of salt on top. Bake muffins in 350 degree oven for 15 minutes or until egg is completely set. Check the center with a knife to make sure the egg is solid. I eat a lot of quinoa., but haven’t made muffins with it. 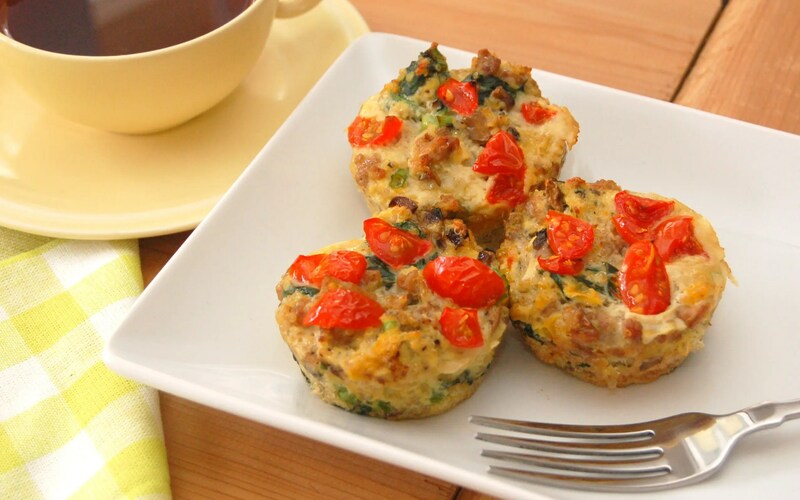 I have to try these.They look delicious & are full of tasty healthy ingredients ! We really enjoy them! Hope you like them too.